History of Fruit: What is Pomology | Mr. Tree, Inc. 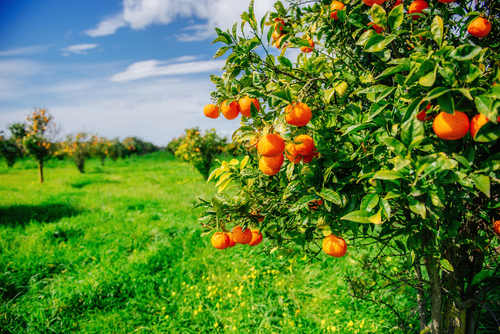 Thinking about growing a fruit tree on your property? We think it’s a great idea! Fruit trees are beautiful and will provide you with shade, clean air, a home for beneficial wildlife, not to mention a renewable source of fruit for years to come! Fruits, of course, are an amazing source of vitamins and nutrition for you and your family and are a delicious way to stay healthy all year long. You get to decide what fruits you want to grow; delicious apples, juicy oranges, or tangy lemons are just some of the options that are available to you. Growing a fruit tree can be a real challenge for someone who isn’t an experienced arborist, however. Cultivating fruit is an art and science unto itself. Actually, the science of growing fruit has a name: Pomology. Simply put, Pomology is the science of growing fruit. It has a very long history in the United States; horticulturists working for the USDA first established a pomology division way back in 1886. The practice of growing fruit trees in America starts long before that, however. To look all the way to the origin, we have to go way back to 1493, when Christopher Columbus himself planted orange, lemon, lime and pummelo trees on the island of Haiti. Over the centuries, the fruit tree never lost its popularity in America. The colonists of Plymouth, Massachusetts grew peach trees. In an effort to avoid scurvy, sailors planted oranges along trade routes. While they didn’t know what Vitamin C was at the time, they did know that the fruits were helpful in preventing the wasting disease. In the Spanish territories, colonists grew fig trees, apricots, and pecans. Fruit trees are so popular in America that they’ve even entered our cultural myths and legends. Everyone knows the story of Johnny Appleseed, and while the famous story of George Washington chopping down the cherry tree isn’t really true, it does show how established fruit trees are in our national culture. Needless to say, nothing about growing trees is easy and fruit trees, in particular, require a good bit of knowledge and effort to cultivate. While people have been growing fruit for a very, very long time, our knowledge of how to do so has only improved over the centuries. Modern technology, including genetic engineering, has allowed us to create trees that are resistant to weather and disease and provide fruits that are ever more delicious and nutritious. Mankind’s history of cultivating fruit to produce the features we want goes back hundreds of years. One method of producing fruit is called grafting. Grafting is a technique where the tissues of plants are connected to one another so that they will grow together. It is very commonly used for modern commercial plants; most of the apples you buy in the supermarket are created this way. Grafting is also used for growing residential fruit trees; the cultivars can be attached to a strong root system in order to facilitate their growth in a particular environment. The branches that bear specific fruit can also be grafted onto other trees; in this way, you can cultivate the fruits you desire for your home. This method works best with young, healthy trees, although it can work with older trees as well. Any trees that have been grafted have to be properly cared for since they can easily become sick or diseased. It will take a while after grafting the branches for the tree to return to full health. If you are interested in this process regarding your trees, contact your local tree service for more information. Before the advent of technologies such as grafting or other forms of genetic engineering, you could attempt to produce the fruits you wanted through careful selective breeding. For example, what we think of as limes today are actually hybrid fruits themselves, having been bred by crossing citrons with mandarin oranges. The bananas that you get at the supermarket have also been carefully bred; the sweet yellow bananas that we have today have only been around since the 1830s. They are descended from a tough green plantain that was suitable only for cooking and not for eating fresh. Most of your favorite fruits have been carefully bred over centuries to produce the foods we know and love today. Fruit trees are bred not just for the quality of the fruit they produce, but also to resist disease and pests and to survive harsh weather conditions. The science of pomology has taken centuries to perfect, but you can make use of its benefits yourself. If you are interested in growing fruit trees on your property, first consider what types of fruits you’d like to cultivate. The options you have available to you will depend a bit on your local environment. Factors such as climate, soil, and access to water will all play a role in how well your fruit trees will grow and bear fruit. In Portland, Oregon, the climate is damp and rainy and certain trees will thrive under those conditions. For example, apples, cherries, figs, and plums are all great for growing in the Portland weather. Whichever trees you decide to grow, you will need to do a bit of planning. Check with your nearest nursery and your local tree service for help with this part of the process. Young trees will need to be cared for and regularly watered each week. As they grow older and stronger, they will require less maintenance, however, they will still need to be occasionally inspected for disease, pest infestations, and to ensure they are receiving proper nutrition. Just as people need regular check-ups at the doctor, fruit trees need regular inspections from a local arborist to ensure they are in good health. With proper care, your fruit trees should provide you with delicious, healthy fruits for years to come!